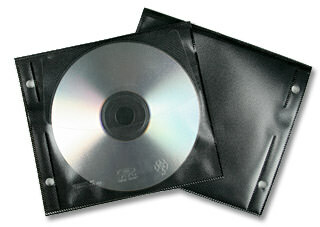 Plastic CD sleeves are a type of transparent packaging designed to protect CDs and DVDs during storage and transport. They are comprised of vinyl or poly plastic materials and are designed with a tightly fitting slot to keep the disc in place. The slot is open at one end for disc retrieval. This form of packaging is comparable to paper CD sleeves, but plastic sleeves allow the entire disc to be seen instead of just a small window. The flaps come in overlay or adhesive styles. Flaps can be folded over the entire sleeve or just about an inch over the top while they stay in place. The option a user chooses should depend on how often they plan to access the disc. When the flap is folded over the opening, the sleeve resembles a near perfect square (about 5.1” x 4.9”, though measurements can vary) to accommodate the disc. Vinyl and poly plastic options can safely accommodate up to two discs per sleeve. Some poly plastic models are equipped with an inner cloth like layer to further shield your disc from scratches or other surface damage. The nature of the smooth plastic on vinyl sleeves can also safeguard against scratches as well as dust build up. Vinyl and poly plastic CD sleeves are compatible with a variety of media projects for distribution, marketing, and storage. They provide lightweight, streamlined packaging while still maintaining a professional look.